Welcome to Austin Hotels. We offer hotel, resort and lodging services at over 150 Hotels in Austin and surrounding suburbs including: Round Rock, Pflugerville, Rollingwood, Lost Creek and many more. We offer the most comprehensive listing of Austin Hotels with great rates, photos, maps, and hotel descriptions. 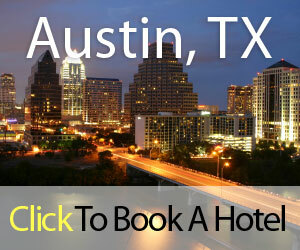 Austin TX Hotels is your one source for the guaranteed lowest rates on all Austin Hotels and accommodations. Hotels listed on this site have been reviewed by previous guests. The individual guest reviews are available on our hotel booking pages and viewable once you pick a hotel to research. Our partner hotels typically offer great discounts off their lowest published rates, saving you money. Let Austin TX Hotels be your guide to Austin. We hope you enjoy your stay! Should you need off-line reservation help or customer service, please call: 1-800-509-9025 and mention promo code: 24491. Austin, is "The Live Music Capital of the World". It's the fourth largest city in Texas and has it's own unique culture which is influenced by the students at the University of Texas and it's substantial population of musicians and artists. The town is famous for it's great scenery and outdoor events. When you visit Austin, make sure you plan to be outside. We have great group rates of meetings and conventions in Austin. Let us negotiate with Austin Hotels for just the right meeting room and discount rates for your next Austin business meeting.